Most every little girls dreams of being a fashion designer at one time or another. Fashion Playtes was created to give them that chance! It is the perfect place for them to express her creativity in a safe, imaginative environment. I recently got to let my girls play around with designing their own outfits, and let me tell you fun was had by all! It’s so easy for your girl to make her own clothes! First she chooses what type of clothing she wants to design – whether it’s a dress, pants, shirt and more. Next comes the color , then it’s time for special touches like ribbons, appliques and she’ll create her own custom label! She can even see what her design looks like by putting the outfit on her online character model. She can either save the design or add it to her wishlist. If you you decide to order the clothes, they’ll arrive at your house in 2-3 weeks. This process is completely safe for your child! The only personal information they’re asked to provide is their parent’s email address. Can’t wait to get started? Fashion Playtes is offering FREE shipping from now until November 30th on any customized dress order with the code DRESSFS! Fashion Playtes wants you to join in on the fun so they’re giving a $100 Fashion Playtes gift certificate to one Southern Savers Reader. 1. Comment: Tell me why you think a gift certificate to FashionPlaytes would be a great Christmas present. 3. Follow FashionPlaytes and Southern Savers on FACEBOOK, or DAILY EMAIL and leave a comment below that you are. This giveaway is sponsored by Fashion Playtes. I received products to review, but all opinions above are 100% my own. I have 3 girls anything fashion inspired will be a WIN for ALL! My daughter would love this as a X-mas gift. Thanks for the chance Fashion Playtes! It would be a GREAT gift for my granddaughter who is a little fashionista already!! This would be perfect for my adopted nieces who didn’t have the luxury of new clothes, much less getting to design and order their own, before they were thankfully placed with my sister. This would be an awesome Christmas present for my little girl, an aspiring fashion designer!! My girls will love to create their own clothes! They are always having mini fashion shows in their bed room! Thanks for the giveaway! This would make a nice Christmas gift for my niece. My daughter would love this as a Christmas present! I follow on daily email! Both of my girls would love doing this… They are both a little princess. I remember Fashion “Plates” when I was a little girl- SO FUN! I cannot imagine how much more fun this would be and would love for Abigail to experience it! This would make for a great gift for my cousin. She is 11 and this is a great way to express her personality! I am following Fashion Plates and Southern Savers on Facebook. My daughter relies on art as a way to express and process her emotions. This combined with a LOVE of fashion makes this a natural gift for her! Thanks for telling us about the site. I loved Fashion Plates as a kid. It is awesome that now, not only can the kids design their own clothes but they can wear them too. What could possibly be cooler than that? Wow! My daughter would love this, she is so picky about her clothes. She likes to cut her shirts and wear them over a longer shirt to make her own style so I know she would love this for Christmas. Designing her own clothes, how cool is that?! I am so excited to help my niece with this. She loves fashion and has a hard time finding clothes due to her size. A gift certificate for her would be the perfect christmas present! my daughter is a fashion bug! okay- officially signed up for the emails! thanks! My daughters would love to make their own clothes for Christmas. It a great way to get them to be creative. My 13 years old daughter loves designing clothes. It will be perfect for her. I am waiting for her to wake up so I can show her the website!! Really cool! My daughter would love to design her own frilly, twirly dress! My two girls would love the gift card for Christmas. They have a unique style. I can just imagine how much fun it would be fun for them to create outfits online and then get to wear them. I wish I was as creative with clothes when I was little as they are. I like Fashion plates and Southern savers!!! giving a gift cert to 3 girls for xmas. i know they are going to love it bc i even had fun checking out the website! My niece would love this for Christmas. She was just telling me yesterday about her plans to be a fashion designer some day! My twins are so creative and love to make things. This would be awesome! I follow Fashion Playtes and Southern Savers on facebook. My daughter loves matching her American Girl doll outfit with hers and she would be able to make several sets with the gc. What girl big or small wouldn’t love to wear her own creation? My daughter would love this. My daughter would be thrilled to be able to design her own clothing! My sister in law is 7 and I know she would absolutely love this! If I win, that would be amazing, but even if I don’t, I’m buying her a gift certificate for Christmas!! Lovin the variety of clothes they offer for kids to choose from, so CUTE! My daughter would adore this, perfect gift! Tweeted and following all 3. My Daughter would LOVE this as a Christmas gift. She does this kind of stuff anyway, and this would just be the icing on the cake! She would love to design her own clothes and wearing them would just make her so proud! This is an awesome product. My friend’s daughter is such an artist, she would love this. This would make a great gift for my two girls becuse they are always trying to design their own clothes. this is the first I have heard of this, and I know they will love to do it. It would put one of the biggest smiles on both of their faces. And that is what it is all about. This is such a neat idea. My sisters bfs family has such a sweet girl and she would love this. My daughter loves FASHION! She has since she was two years old. I would love for her to have something to help her express her creativity! it lets kids be creative, but still lets parents have some control over what they wear. i don’t have my own daughter but i have several adopted ones! This is seriously the coolest thing i’ve seen in a long time, even for me, & i’m 32!. This sounds so cool! I know my daughter would love this and it would give me something to check off as a Christmas gift. everyone could use a bit of fashion! My grandkids will love this! Creative as they are. My BFF has two girls and I have two boys. I never know what to get the girls so this would be brilliant, especially for her youngest who is so creative already. Great gift so that the recipient can pick what they like. This is two steps better than giving a kid a gift card to a store. Not only do they get to pick what they want, they get to make it exactly like they want. A certficate to Fashion Playtes would be great because it allows the gift receiver to pick out exactly what they want! this is a save way for my niece to practice her fashions and practicing her modeling posture. ….because money is tight this year! Because we’re all looking for creative gifts, and this takes the cake! It would be perfect for that hard to buy for teen!! This would be perfect for thatthat niece that you are not quite sure of her style! I get the SS Daily Email and like Fashion playtes on FB! my daughters would have a ball getting to do this! This would make a great gift for my goddaughter! We are on a limited budget for the holidays but more than that it is really hard to find things suitable for my 9 1/2 yr. old. She has taken a really affordable sewing class in the past and unfortunately the teacher had to stop teaching. Our goal this year is to spend more giving than receiving and to teach our 2 daughters the TRUE meaning of Christmas. My 7 yr old daughter would LOVE this. She already spends all her free time filling up notebooks drawing fashion designs. It would be so much fun for her to have a gift card to design online and wear the things she made!!! My daughter loves to create. What fun it would be for her to create something she could actually wear! Because my daughter loves fashion * it wuold be fun! Following you and Fashion Playte on facebook! My 10 year old loves to create designs in drawings and out of her closet/playchest. She changes clothes about 50 times a day – more if she has girlfriends over. Perfect opportunity to turn her to turn a favorite past-time into reality. Love to win! What an awesome idea Fashion Playtes!! This reminds me of the game I had when I was young. You rubbed over fashion plates with a black crayon and you could create your own look then color it. My two girls would love this. One loves fashion more than the other but however both like being unique. Creating their own outfit and no one having one exactly like it would be cool! I just had that same flashback!! little plastic pink plates that you chose for the top, bottom, and maybe hair? some of the rubbings had “texture” so you could color in plaids….that was back when my parents’ phone was an olive green rotary dial. I AM NOT OLD. My teen girl would love this. She has great fashion sense & helps me pick my clothes. Perfect for the picky girl who doesn’t like anything you pick out for her. I love Fashion Playtes! I got my neices a gift certificate last year and they LOVED designing their own clothes. I like it because it allows girls to use their creativity! Fashion Playtes would be a wonderful gift for my 4 year old daughter! She loves playing dress up and would have a great time! I follow southern savers & fashion playtes on facebook. 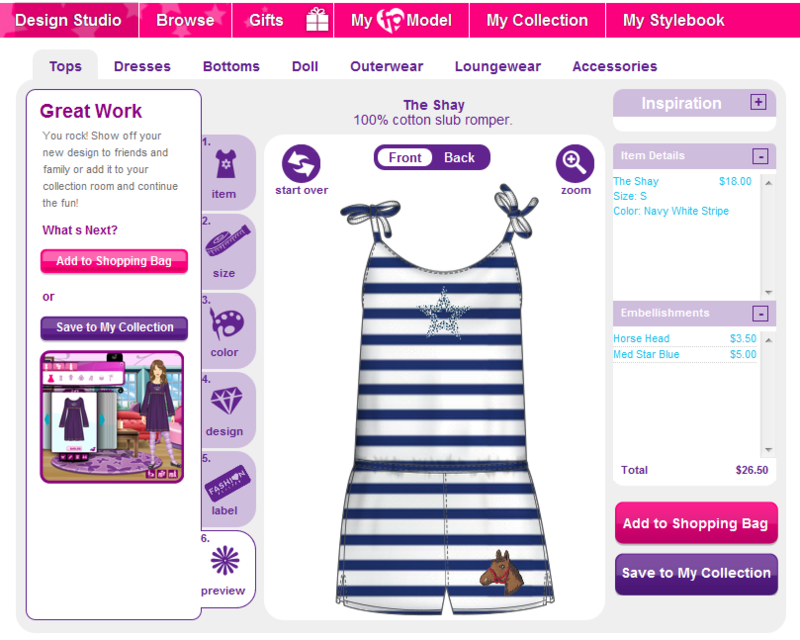 my twelve yr old has been designing for years, so when I showed her this site she was beside herself! Fashion Playet is definitely going to be a big deal in this house. She is so excited! Now I’m off to tweet and Facebook this amazing deal and site! Any young girl would have a blast doing this !!!!! My daughter loves playing games on the computer where she can design clothes, she’ll love this! I think this would be a great gift for my oldest daughter because she can design the clothes that she wants, and she can wear it for when her Daddy comes home for his leave from Afghanistan. My girl has been begging me to let her design & order from this site. She would be so excited! My daughter would absolutely love to design her own clothes, plus I love that is something we can do together and it is creative! My Little Girl would love to be a fashion designer at 7 yrs old! what a great idea.. And we can do this project together! following :) wish me luck! I love toys and games that encourage imagination and creativity. Great gift for my granddaughter. My daughter loves to design anything, clothes, houses, hair. This would be perfect for her! This would be a great present for my niece! My 9 y.o. daughter would LOVE this! It encourages creativity! Like you both on Facebook! My daughter is so creative and artistic. She loves to design her hair, her room, and she makes everything so pretty. She would love to design her own creations using Fashion Playtes. I like Southern Savers and Fashion Playtes on FB. I also subscribe to your Daily Emails. Thanks! My niece would love this – she’s always trying to make things for herself anyways! I am a fan of both of yours on Facebook. OMG! My daughter draws her designs in a little book. She would LOVE this!! And to actually wear the clothes you design, wonderful!! This would keep my daughter very busy! I follow you FB and I like Fashion Playtes on FB! My girls LOVE Project Runway and design their own clothes all the time. My 11yr old sketches in notebooks all the time. Fashion Playtes looks like an awesome Christmas gift. My daughter absolutely loves to design her own outfits. She has notebooks full of sketches. This is totally up her alley. I have already used Fashion Playtes, but would love to do it again! It would make a great gift for my 8 year old bc she loves to match her AG doll and loves fashion. Such a great idea! Thanks for the opportunity to win. And I just liked you both on FB. Thanks again. My niece loves this site. She is ten. She loves designing her own clothes and wants to be a fashion designer when she grows up! My niece would love some Fashion Playtes for Christmas!!! My oldest daughter is always drawing fashion designs she would Love This! What a great gift! My daughter loves to design, but never gets to have her creations come to life. With a fashionista in our home this would be a great gift! This would be a great gift for my niece, Madyson. My daughter would love to create her own clothes! My daughter would LOVE this for her birthday! What a perfect activity for my daughter and I to do together! I have an amazingly creative daughter who would not only be thrilled to win this Christmas present – but she would actually use it :)! this would be fantastic for my picky daughter. Cannot wait to show her this website! My daughter would have a blast designing her own clothes… she is very crafty! I think a gift certificate to FashionPlayes would be a great present for my daughter as she loves to design things and would love to actually design her own clothes. I follow Southern Savers and FashionPlaytes on Facebook and receive your daily emails. My 4 year old daughter loves playing dress up. This would be the ultimate gift! Would be a great Christmas present! My grandaughter is a fashioista! I would love to give her this! I think it would be a great gift because my daughter is really into stuff like that right now and would thoroughly enjoy it. I receive Southern Savers via email. My daughter is a budding fashionista and i know she’d love to create her own clothes! It is unique and fun! My little fashionista would go nuts for this! I’d love to give it to her! I think a gift certificate to FashionPlaytes would be a great Christmas present because it’s different from most toys. This would be great cos the girls can not only design their own clothes, but they get to “buy” and wear them too! i like fashionplaytes and southern savers on facebook!!! My daughter would love to design her own dresses for church. I have one daughter who, since she was about 2 would beg for a couple of those paint color sample cards every time we went to the store. She loves putting them side by side. She checks how the colors look together, she has drawn patterns on some, simple, cheep fun. She would love this. following fashion playtes and southern savers on facebook! i think it would be an awesome Christmas present because it’s unique -it allows them to use there imagination and creativity and is going to be one of a kind! no one else will have it! i am all about individuality so i LOVE this!! Because my daughter is six-years old and so into dress-up and fashion! My 9 year old daughter would absolutely love doing this. I think this is a great gift because girls can put their own personal touches on their clothes, which I’m positive most of them will love! I like both you and Fashion Playtes on Facebook. My girls would really enjoy getting creative. My daughters would love this as a gift. They both are creative and love clothes…so this would be the perfect gift! My daughter loves picking out her own style and makeup she would love this giftcard!